APRO, the world leading supplier of NAND Flash Storages for industrial & military applications is now announcing HERMES-I Series SLC SATA III CFast™ card which is designed with industrial SLC NAND flash IC in order to meet the demand of high endurance for small files full-time transferring in the industrial and embedded system. APRO HERMES-I Series SLC SATA III CFast™ card uses Maxiotek (formerly JMicron) controller and Toshiba NAND SLC Flash IC, providing the sequential read/write speeds of 330MB/s and 190MB/s, and 4K random read/write speeds at 11.5K/14.2K IOPS. In addition to complementing SLC NAND flash IC, the firmware of HERMES-I Series SLC SATA III CFast™ card is designed with below technologies to ensure the reliability and increase the lifespan for NAND flash IC on heavy workload. ECC: Error Correcting Code (40 bits per 1024 bytes) is used to examine if the data is correct while transferring. When the system shows error, ECC can protect the system to operate functionally by correcting the error automatically or request the system to re-transfer the data and keep the system away from the crash. Power Loss Data Protection: In order to ensure that the last read/write command can be completed, the power loss data protection will immediately stop reading or writing command when it senses the unstable power or insufficient wattage. Therefore, the data can be safely and completely saved in the CFast™ card. Once the power is restored, the system will move on with the process. Static Wear Leveling: static wear leveling is used to prevent the updating static data from staying in the static area and makes blocks fully and evenly applied, then each block can have the same usability. The static data includes OS files, lookup table, running files, ...etc. Garbage collection & TRIM: It has the direct influence on performance and lifespan of CFast™ card. The CFast™ card must use garbage collection & TRIM to reduce the amount of garbage collected in order to decrease the unnecessary wear and maintain the lifespan. S.M.A.R.T. : APRO HERMES-I Series SLC SATA III CFast™ card supports S.M.A.R.T. command set (Self-Monitoring, Analysis and Reporting Technology). The users will know the health condition of CFast™ card from S.M.A.R.T.. It can not only predict the lifespan of CFast™ card, but collect the data to know the degree of CFast™ card usage, letting users change the new product at the proper time without any doubt. Or, you can also provide the relevant data to APRO engineer to do the technical analysis, and APRO will offer the effective solution. In order to match up the SATA interface in current industrial motherboard, APRO HERMES-I Series SLC SATA III CFast™ card uses SATA interface and replace the traditional CF card which is designed with PATA (Parallel ATA or so-called IDE) interface. It is fully compliant with CFast™ 2.0 specification, ATA/ATAPI-7 protocol standard and is designed with CFast™ Type I with 7-pin data and 17-pin power connectors. Combining CF card's form factor and SATA interface makes APRO HERMES-I Series SLC SATA III CFast™ card the best solution under the conditions of small form factor and harsh environment. APRO HERMES-I Series SLC SATA III CFast™ also conforms to the SATA 3.0 (6.0Gb/sec) specification with low power consumption and is the ideal option for industrial application, but provides compatibilty with 3.0Gb/s and 1.5Gb/s interface as well. In addition, in order to ensure the reliability of quality and ability in different environment temperatures, APRO chooses strictly the specific components to conform to the standard of the industrial system. APRO HERMES-I Series SLC SATA III CFast™ card is designed to be used not only in the standard temperature 0°C ~ +70°C, but also in wide temperature -40°C ~ +85°C. Moreover, APRO applies the conformal coating to the PCBA of CFast™ card to consolidate the abilities of moisture, dirt, and dust prevention and chemical pollution. The conformal coating can also avoid the corrosion from soldering, becoming an isolation and eliminating the electromagnetic interference. The capacities are available from 4GB, 16GB, 32GB, and 64GB. APRO HERMES-I Series SLC SATA III CFast™ card is more suitable as a data storage for small files random read/write as well as an optimal solution as a booting disk . CFast™ card is based on SATA bus instead of the old PATA / IDE bus. CFast™ card combines with the form factor of CF card and SATA interface to replace the PATA interface. With the features of low power consumption, small form factor, long lifespan, anti-vibration, high shock resistance, and withstanding extreme temperature and harsh environment, the CFast™ card has become the attractive solution to replace CF card in industrial application. CFast™ card is normally applied in camera, surveillance server, and ticket vendor. The APRO team has more than 15 years of experience in the industrial & military applications field. We deeply understand the keys and features for those critical systems equipped with NAND flash storages. 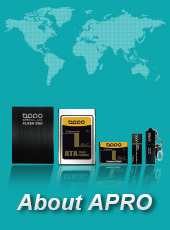 APRO is also fully aware of the features and needs of Industrial & Military customers, able to share extensive experiences in industrial NAND flash memory storages, and providing comprehensive product lines with full capacities to satisfy customers' requirement. APRO upholds the professionalism to deepen customers' satisfaction with APRO's services and experiences. APRO emphasizes products' stability and long-term supply and protects the rights and the most interests of customers. APRO also deliver a small quantity and various special specifications to meet customers' requirements. If you have any product and service inquiry, please contact APRO, APRO sales team will reply your inquiry within 24 hours during weekdays. Address: 11F-5, No.738, Zongzheng Rd., Zonghe Dist. New Taipei City, 23511 Taiwan.